The first time I ever saw a Wes Anderson movie was while I was in high school. A group of friends and I rented The Royal Tenenbaums from Blockbuster and watched it under blankets at my friend Erica’s house. I remember majority of our group didn’t like it, but to be fair we were all around 15 years old. I wasn’t in love with Royal Tenebaums after that first viewing, but I was really intrigued. I went on to watch Rushmore and then Life Aquatic when it came to theaters. Ray and I even watched Darjeeling Limited in a theater full of baby boomers. These movies were different and stylized and the aesthetic really resonated with me. Before I knew it, they were some of my absolute favorite films! 1.Team Zissou Swim Shorts – I want Ray to have these so bad! Life Aquatic is his favorite Wes Anderson film AND he hasn’t owned a swim suit in probably 10 years. 2.Grand Budapest Hotel Pencil Pack – Perfect for writing plays and love letters. 3. 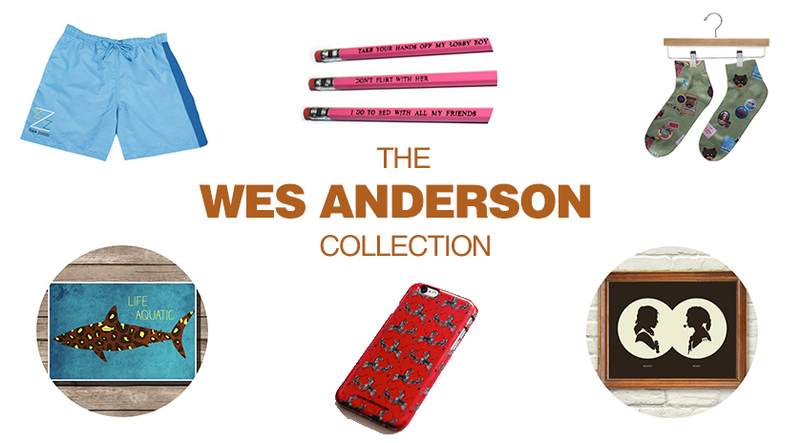 Wes Anderson Collection Socks – These are the cutest socks and they feature images from several of his films. 4. Moonrise Kingdom Print – I love this Sam and Suzy silhouette print! 5. Zebra Print Phone Case – This print is actually of the wallpaper in Margot’s room in Royal Tenenbaums. It’s iconic and I’m in love with it. 6.Life Aquatic Movie Poster – I think this would look perfect in our dining room! This entry was posted in favorites and tagged favorites, life aquatic, the royal tenenbaums, wes anderson on March 13, 2015 by allison.